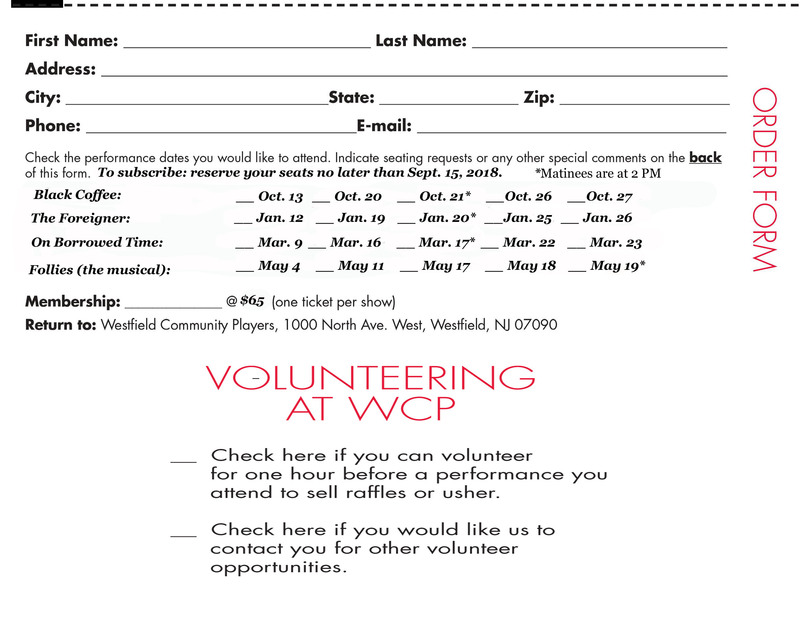 This form is for reserving tickets to our regular season productions. You have requested it and we have listened: You can now purchase your tickets on-line for all four shows in the 2017-2018 season at once or show by show. 3) Call the Ticket Line 908-232-1221 - Please say and spell your name slowly and clearly and leave your home phone number for confirmation. State the number of tickets, the performance date and your seating preference. Your order will be confirmed by phone. All tickets will be held at the box office for pick-up before the performance. All seats are reserved. Reserved tickets may be exchanged free of charge, subject to availability. Please note that tickets that are not picked up 15 minutes before curtain may be subject to sale. You will be able to make another reservation for a remaining performance of the same show, if available. Ticket prices for non-members are $22 for plays and $25 for musicals. Student tickets for $10 for plays and $15 for musicals are available for all performances. Group discount of 10% given to groups of 20 or more. To request tickets on-line, please click on the appropriate links below. If you didn't receive our Membership Form or would like to join, please print out the form below and mail it with your payment to the address listed. Print the above form and return it with your payment to the address listed on the form.